Daughter of Giovanni Battista Sterni and Giovanna Chiuppani; one of six children. Her father was an administrator for the country property of the Mora, who were members of the Venetian nobility. The family lived relatively comfortably until Gaetana was about 15 years old when, in short order, her elder sister Margherita died, her father died, and her brother Francesco left home to become an actor, leaving the rest of the family in sad shape financially. Gaetana, a pious girl, did what she could to help her mother, but soon attracted the attention and a marriage offer from Liberale Conte, a widower with three children. Gaetana accepted, and was soon very happily married and pregnant. However, during prayer one day she received a prophecy of her husband's early death; it proved true, and she widowed before their child was born. The baby died a few days after birth, and her late husband's family demanded that her three step-children be returned to them. At age 19 Gaetana found herself a widow, alone, broke, alienated from her in-laws, and having buried a child; she returned to her mother's house. She spent much of her time there in prayer, looking for a direction for her future, and finally came to understand that she had a call to the religious life. Joined the Canosian convent at Bassano, Italy for five months, but received another prophetic message in prayer that foretold her mother's death. Her mother died a few days later, and Gaetana left the convent to care for her younger siblings. She was head of the household for the next six years. Free at last at age 26, she began to fulfill anther message she had received in prayer while with the Canosians. There she had been told "to employ there all of herself in the service of the poor and thus fulfill His will." A Jesuit priest confirmed this message for her, and in 1853, she began work at the hospice for beggars in Bassano. She would remain there for her remaining 36 years, tending to the aged, the sick, the dying. In 1860, at age 33 she made a private vow of total devotion to God. In 1865 Gaetana and two like-minded friends formed what would become the Daughters of the Divine Will, a name chosen to indicate that the members would surrender themselves completely to God's plans. They dedicated themselves to service to the sick and poor, and worked especially with those who were sick, but still able to live in their own homes. The bishop of Vicenza, Italy approved the congregation in 1875, and today the Daughters are working across Europe, America, and Africa. Son of Domenico Casanova, a sea captain, and Anna Maria Benza. Placed at age thirteen with his uncle Agostino to study for a career as a physician, but the youth decided against medicine, and his uncle disowned him. Studied at the Jesuit College in Rome, Italy. 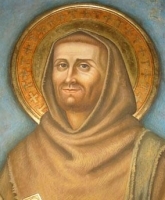 Joined the Riformella, a branch of the Franciscans of the Strict Observance on 2 October 1697, taking the name Brother Leonard. Ordained in Rome in 1703. Taught for a while, and expected to become a missionary to China, but a bleeding ulcer kept him in his native lands for the several years it took to recover and regain his strength. Sent to Florence, Italy in 1709 where he became a noted preached in the city and nearby region. He was often invited to other areas, and worked for devotion to the Blessed Sacrament, Sacred Heart, Immaculate Conception, and the Stations of the Cross. Established the Way of the Cross in over 500 places, including the Colosseum in Rome. Sent as a missionary by Pope Benedict XIV to the island of Corsica in 1744. There he restored discipline to the holy orders there, but local politics greatly limited his success in preaching. He returned exhausted to Rome where he spent the rest of his days. Born to the Italian nobility. Began the study of civil law in Bologna and Padua in Italy in 1197. Renouncing civil law, he studied theology and was ordained in 1217 in the diocese of Osimo, Italy; his father was so upset with the change that he refused to speak to his son for ten years. Canon in Osimo, Italy; his ministry was so successful that his local bishop became jealous. Hermit at age 50, living on herbs and water, sleeping on the ground, and spending his time in study and prayer; his reputation for learning and holiness attracted many students. He received a vision of Saint Benedict of Nursia in 1231 and understood that he should form his spiritual students into a formal community. Founded a Benedictine community at Monte Fano, Fabriano, Italy, a house devoted to strict adherence to the Benedictine Rule, and built on the site of an old pagan temple that Sylvester destroyed. The Order, known as a the Sylvestrines or Blue Benedictines, was approved by Pope Innocent IV in 1247, Sylvester led them until his death decades later, Sylvester founded eleven houses of them in his time, and they continue their work today. Priest. During a period of turmoil in his diocese, Bellinus stayed loyal to the bishop appointed by the legitimate Pope. Bishop of Padua, Italy. Led a reform of the spiritual lives of the canons in his diocese, and the effort to rebuild the cathedral after its destruction in 1117 by earthquake. Worked to re-build the status and dignity of the Church, defended Church rights and helped build schools. Killed by assassins paid by the Capodivacca family of Padua; Bellinus was becoming very effective in building up the Church at the expense of the noble families. Martyr. Second son of Count Heinrich von Altdorf, part of the Guelf family. Educated at the cathedral school at Constance, Germany (in modern Switzerland). Priest. Provost of the cathedral. Bishop of Constance from 934 to 975. Made three pilgrimages to the Holy Lands. Accompanied Emperor Otto I to Rome, Italy. Renovated churches in his diocese, and built three new ones on lands he inherited. Known for his charity to the poor, and his lack of concern over the power politics that occupied so many other bishops of the day. During Mass one day a spider dropped into the chalice of Precious Blood; though Conrad believed all spiders were poisonous, his love of communion overcame his fear, and he drank the Blood, spider and all. He did, of course, survive. On 14 September 948 Conrad was witness to the miraculous consecration of the Chapel of Mary, Einsiedeln, Switzerland by Christ and some angels. Seminarian in Bra and Alba in Italy. During the night of 31 December 1900 to 1 January 1901, while doing nightly Eucharistic adoration in Alba, he suddently felt he was called on to do something for the people of the new 20th century. Ordained on 29 June 1907. Parish priest in Narzole. Spiritual director for youth and altar servers in the Alba seminary on 1 October 1908. Director of the weekly publication Gazzetta d'Alba beginning in September 1913. Founded the Society of Saint Paul on 20 August 1914. Founded the Daughters of Saint Paul on 15 June 1915. Founded the Sisters Disciples of the Divine Master on 10 February 1924. Founded the Sisters of Jesus Good Shepherd in Rome, Italy in August 1936. These congregations, under his leadership and on to today, publish materials to spread the word of God, and help in personal devotions. Instituted to give public homage to Christ, the Ruler of the world, by Pope Pius XI, 1925. Every year on this day is renewed the consecration of the world to the Sacred Heart of Jesus. Born to the nobility of the Savoy region (in modern France). Monk at the Canonici Regolari di Abondance abbey as a young man. 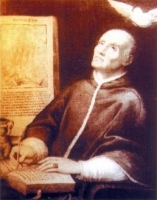 Over the years he helped revise the constitutions of the abbot to put them in closer accord to the Augustinian rule. Founded a religious house in Sixt, Savoy in 1144, and served as its first abbot. Abbot of the Abondance abbey in 1172. Late in life he retired from the abbacy to spend his final days as a prayerful simple monk. Son of Tiburtius. Lector. Deacon. Friend of Saint Ambrose of Milan. Unanimously elected 38th pope in 384. He was opposed by the anti-pope Ursinus, but the pretender could not get any support, and nothing came of it. Expanded papal power and authority, decreeing that any papal documents should receive widespread distribution. Held a synod at Rome, Italy on 6 January 386 which re-affirmed a variety of canon laws and disciplines for both clergy and laity. A separate synod in 390 to 392 re-affirmed the merits of fasting, good works, and the need for celibate life among the religious and clergy. Opposed the Manicheans. Settled the Meletian schism at Antioch. Married layman and father. Fearful of the persecutions of the day, he was a covert Catholic who put in appearances in the Established church to keep the authorities away. He sheltered priests on the run, and had his children raised Catholic. In 1585 his children's tutor was arrested and bribed to apostatize, turn informer, and denounce Bowes for helping priests. Bowes and his wife were arrested and imprisoned in York; she was released, but Marmaduke was convicted on the statements the tutor. First layman executed under the law that made helping priests a felony. Martyr. Deacon. Gave away all his possessions to live first as a monk, and then as a cave hermit and finally as one of the early ascetics who would live atop a pillar for long periods. Studied at Rheims, France. Ordained in 1584. Ministered to covert and oppressed Catholics in England starting in March 1585. He worked for only a few months, being the first person martyred in the persecutions of Queen Elizabeth. One of the Martyrs of England, Scotland and Wales. Related to the Counts of Haigerloch, Hohenzollern (Germany). Benedictine monk at Oberaltaich, Bavaria in 1261. Head of the monastery school. Prior of his house, and priest of the surrounding parish. Insured support for the monastery scriptorium, and started care for lepers in the area of the Danube. Franciscan lay-brother. So renowned for his sanctity, he was summoned to Rome to be counselor to Pope Gregory XV and Pope Urban VIII. Dominican priest. Worked in the Dominican missions in Vietnam. Martyr. Dominican priest. Tortured and martyred in the persecutions of Minh Mang. Benedictine monk at Verzy, France. Lived for 40 years as a hermit on a hill near Rheims, France. Miracle worker. Monk at Corbie Abbey in France. Priest. Court chaplain and confessor of Charles Martel. Monk. Hermit. Miracle worker. His reputation for wisdom and holiness led the emperor to ask James to attend the Council of Chalcedon in 451. Married to Saint Elzear of Sabran. Widowed, she spent the rest of her days in prayerful poverty. Daughter of Matilda and Erenfrid, Count Palatine of Lorraine; her brother was Archbishop Hermann II of Cologne, her sisters were Queen Richeza of Poland and Abbess Theofano in Essen. Nun. Abbess of Saint-Mary-in-Kapitol Abbey in Cologne, Germany. Seventh century prince of Wessex, England. Lived as a prayerful hermit at Athelney, Somersetshire, England. Monk. Wandering preacher and evangelist, especially in Greece, calling everyone to repent (metanoete). Spiritual student of Saint Germanus of Auxerre. Priest in Asia Minor. Martyred in the persecutions of the Arian Emperor Constantius. Priest in Herzfeld, Germany. Spiritual director and confessor of Saint Ida of Herzfeld. 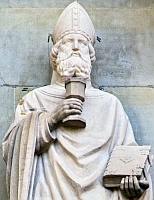 Bishop of Autun, France c.270. Brought the Gallic Aedui tribe to the faith. Eleventh century hermit in Visegrád, Hungary. A group of approximately 650 Christian priests, bishops and laity martyred together in the persecution of Maximian Galerius. We have the names and a few details only seven of them - Ammonius, Didius, Faustus, Hesychius, Pachomius, Phileas and Theodore. A group of seven Christians martyred together. The only details about them to survive are the names - Ammonius, Cassianus, Felicissimus, Nicander, Romana, Saturnin and Serenus. A group of six orthodox Christians martyred by Arians. Few details have survived except their names - Marcellus, Melisus, Numerius, Peter, Serenusa and Victorinus.